Click here or on the image below to download a copy of the Summary Report. That was one high-energy afternoon! Wow, were there lots of ideas flying every which way! The workshop is over, the compiling of all those sticky note details and drawings is underway (and do be patient for the report to be posted on this website, the compilers are just as volunteer as every workshop participant) but you have "just one more thing" you want to contribute. Send an email to NobleNeighbors@gmail.com with your words and sketches. Click on links below for articles, photos, maps and charts. The more people who spend a bit of time preparing, the better our planning and imagining will be! This is a wonderful and creative reflection on neighborhoods, as Mr. Rogers defined them. This is what it's all about friends, making spaces for people to interact, and even become interdependent! 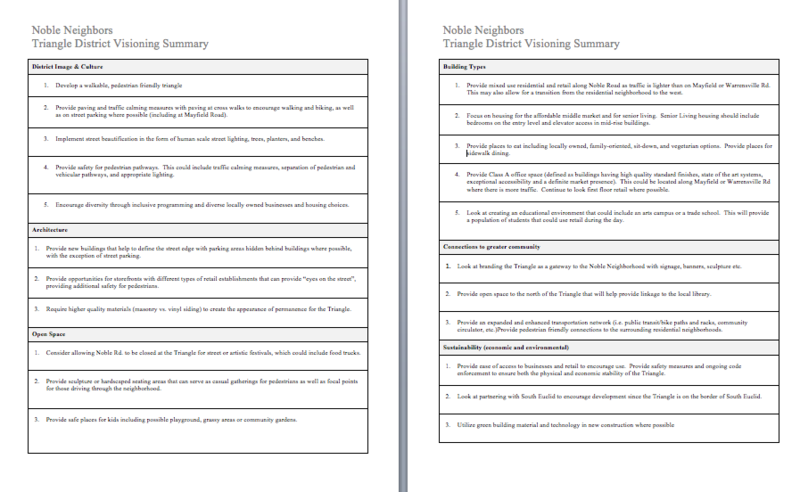 We have two opportunities to help you prepare by walking the Triangle District. 1. Self-Guided Tour: Down load the form you see on the right. It leads you around the district and asks you to consider features that are present or that are missing. It will help inspire good discussions at the Workshop! 2. Leader-led Tour: Join Roger Bliss at 6pm on Saturday, July 8 at Christopher's Pub. From this starting point, walk the district, discover those "I never noticed that before" features, and engage a lively discussion with your tour-mates! Bring that energy and inspiration to the Envision a New Triangle District Workshop the next day. IrishTown Bend Planners Seek Public Input This cleveland.com article on June 18 describes that public input is critical for this Flats development. On June 21, another article was published about the presentation and the meeting. Note that differing points of view were valued. Spend time looking at the presentation document. Our Workshop is at the very beginning phase - gather imaginative minds for a brainstorm session. We're working toward presentation proposals like you see in this article, so stay tuned and stay involved! Van Aken District Note the chronology and communication for Shaker Height's Van Aken District project. Click on the links on this site to learn the unfolding story. Notice that this process has spanned years and years, and that there was a seven year gap between the recommendation to do something and the first meeting for public input. Note also that the ball started rolling after that! Folks, that's where we are - at the "get-the-ball-rolling" catalyst stage! These are two short videos about a district in Australia. In the ​first video, notice what is attracting young adults. Listen also to how they think 'outside the box' about garbage pick-up! In the second video, listen to how they want to attract commerce with great people spaces. Enter Maroochydore in the YouTube search box and you'll see more videos. Jeff Speck does a wonderful job giving us design principles for walkable neighborhoods in this TED Talk.This is really good. Find a dedicated 20 minutes to watch this. Theaster Gates is a potter on the south side of Chicago. He's reshaping his neighborhood from the cultural and social starting points which is in turn changing development. Note that in this TED Talk Q&A at the end, he is talking about many of the same things we've discussed in Noble Neighbors. This document shows a few Google captures of buildings in a light industrial district in Durham, NC. Note the mix of work and play in this area. 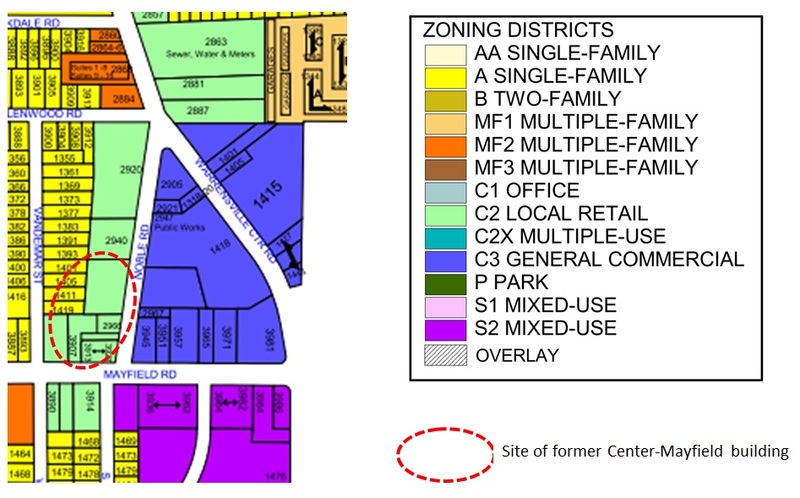 Notice also how these structures are similar to our Triangle District structures. Click all over the Better Town Toolkit for great ideas and practices. Lots of good pictures and diagrams here! 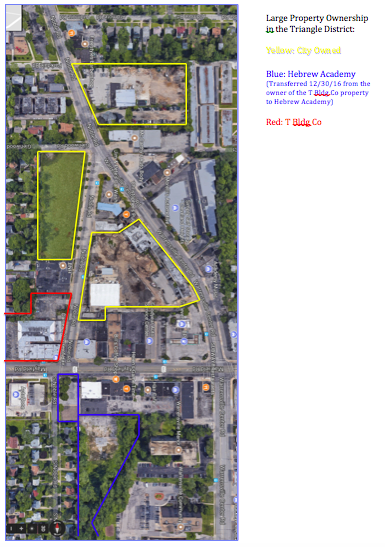 Significant portions of this district is owned by the City of Cleveland Heights. While we can easily propose alternative uses for the properties, we'd also need to consider alternative sites for city needs.